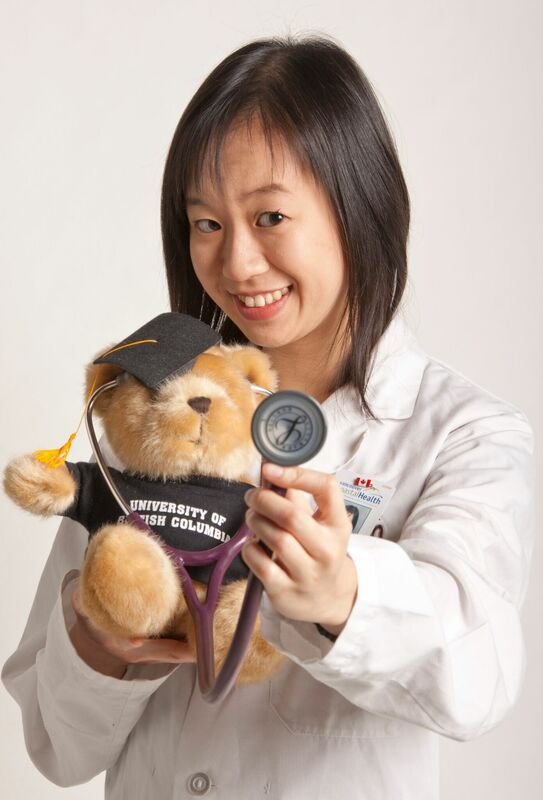 Jennifer is completing her medical residency at SickKids Hospital in Toronto where she focuses her research primarily on infectious diseases in pediatric patients. Jennifer’s team spearheaded a study examining the usefulness of measuring blood levels of HIV medications routinely compared to on an as-needed basis. They found that measuring blood levels on an as-needed basis was more useful in clinical practice. In 2015, Jennifer’s team was recognized for this discovery at the SickKids Pediatrics Research Day. 1. Why did you choose to go into pediatrics and what do you enjoy about it? Aside from not having to wear a lab coat when working in Pediatrics, I really enjoy the environment of pediatric hospitals. For example, SickKids has a very unique vibe – it doesn’t actually feel like you are in a hospital because it has a very open design and in a way looks more like a mall. The best thing about working with kids though is that I always leave the work smiling. 2. What are some of the most rewarding aspects of pediatrics? It’s amazing how resilient children are. Despite how sick they might be, so many children can bounce back from just about anything – it is truly inspiring and reminds you to never give up in life. 3. And what about the challenges? There is a general consensus that one of the most challenging aspects of Pediatrics is working with an entire family rather than just the patient. However, if you mentally put yourself in anxious parents’ shoes and try to understand what they’re going through, you realize that they are just trying to make the best decisions they can for their children. Then, it isn’t a bad thing at all. 4. What are some of your goals in your research and in pediatrics? My goals primarily are to be a clinician and provide service to patients. In terms of my research in infectious diseases, my goal is to focus on studies that will affect clinical practice in a positive way. This also includes a focus on medical education, as one of the most impactful things in medicine is influencing clinical practice where it starts – during training! 5. Today in healthcare it’s important to…. Remember to take care of your own health too! Physicians can often get caught up in their daily work and forget to take care of their own basic human needs, such as eating, sleeping, and going to the washroom. In order to provide the best care possible to your patients, you have to take care of yourself, too. 6. What do you consider your greatest achievement to date? Staying alive through the completion of my residency in a new city despite not being able to cook (luckily my husband is more talented in the kitchen)! 7. Was there anything specific about your medical education at UBC that prepared you well for this area of medicine? I may be biased, but my impression is that UBC medicine graduates have a reputation for being clinically strong. One particularly memorable rotation for me was Pediatric Cardiology at BC Children’s Hospital. With early mornings and late evenings, as well as the expectation of keeping on top of readings, the rotation had rigorous demands. The experience was a real eye opener into the dedication that the career entails. My co-medical student during the rotation also emphasized to me that medicine is a team sport because together, we learned a lot more and got more out of the rotation than we would have alone! Pediatric Infectious Diseases physician, Dr. Tobias Kollmann, comes to mind as an influential and inspiring professor. He was able to explain complex concepts and aspects of medicine that we take for granted in clear and concise ways. It made Pediatric Infectious Diseases seem like an incredibly fascinating field (and I can confidently attest that it is, as I am doing my subspecialty training in that now!). Dr. Kollmann is an exemplary clinician and scientist. 9. Favourite memories of UBC Faculty of Medicine? Of my most meaningful experiences as a medical student was my involvement in the development of the UBC Medical Journal (UBCMJ). As part of the group that started UBCMJ, I learned a ton about how research publications work and developed lifelong friendships during the process. 10. What advice do you have for current UBC MD students about the match process? It is easy to get stressed out about the process, but remember – most of it is out of your control, so there is no point in stressing out about it because that won’t change anything! (I know, easier said than done, but give it a try.) No matter where you match to, keep an open mind and make the most of whatever you are doing and whatever city you’re in, because that is in your control. 11. What profession might have you pursued if not for medicine? I completed my pharmacy degree at UBC in 2007 and know that pharmacy is an amazing career. I eventually realized that my passion was in medicine, but loved being a clinical pharmacist as well. Since moving to Toronto to complete my medical residency, I’ve started practicing Taiko drums, which are traditional Japanese drums performed in a group ensemble. I meet with a women’s Taiko drum class twice a week. Way back in the day, Taiko drums were only to be played by men, so our all-female group is a form of female empowerment. Really though, I mainly go because I love hitting giant drums with giant sticks to make resonating rhythms in a group. I want to travel to every continent in the world. After travelling to Antarctica and South America this winter, I will only have Australia left to go!